As you probably can guess, I spend a lot of time in Birdsong Studio, a small shop that Jim Dorie - the previous owner of this property - built to work on his motorcycles and play music. While I've never measured it, my guess is that it would be 12-feet by 20-feet. There are two features about the space that stand out. The first is its oversized door - it was built to easily allow motorcycles to be brought in. The second is its warmth - Jim insulated it very well. This weekend I spent hours in Birdsong with Jared Shore, a new client who had received a private painting lesson with me from his wife for his birthday. An accomplished singer/songwriter originally from Calgary, Jared is a speech pathologist and occupational therapist who works with the fine folks at Dr. Clark School. We had a grand ole time painting Chief Poundmaker and talking up a storm about common interests. 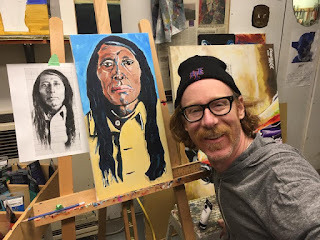 Jared joins Taylor and Jay as unofficial members of Birdsong Studio, with the open invitation to come and paint with me any time. "I wouldn't want to impose," he said. "As an artist, you must cherish your private time." "I get more hours alone in the studio than you can possibly imagine," I said. The truth is that I like have people in my creative space. 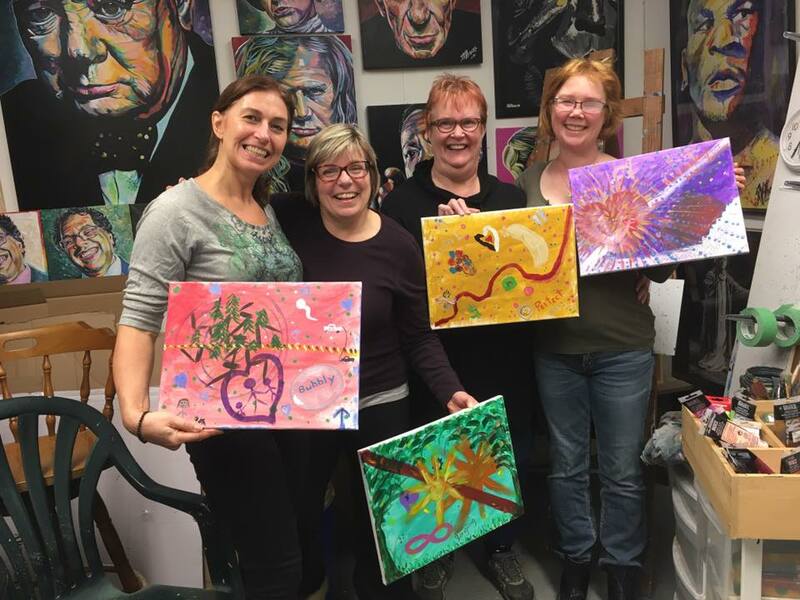 It was equally lovely to have Heather and three of her inner circle in the studio on Sunday as I took them through my "Painting Your Life" workshop. This was a gift from Heather to her gang as a special surprise. They went on a journey into their memories and expressed what they saw and felt on the canvas. It was at times gloriously funny, at other times profoundly moving. As I sit for hours at my trusty easel - the older one that is covered in many layers of paint - I am mostly alone, surrounded by friends. To my left at the moment are Miles Davis, Marilyn Monroe, Leonard Nimoy, and Winston Churchill. To my right are Mike Tyson, Sophie and George. As paintings cycle in and out of Birdsong Studio, my guests change, which is a fascinating dynamic. My studio isn't overly clean, nor is it completely tidy; it is somewhere in between. Mostly, it's comfortable and welcoming. Maybe that is why hundreds of people have been through to visit over the last two and a half years. If you ever feel like dropping by, be sure to drop me a line.